Although listings in many rural property sectors and throughout most of the country rose in the spring, these have not yet translated to sales. Cold, wet conditions early in the season delayed many spring marketing campaigns. Couple that with the general election, post-election coalition negotiations, and then uncertainty about how far the new government will take some of its farmingfocused policy promises, and many prudent farmers are taking a wait and see approach before committing to purchase land, despite the abundant choice on offer out in the market. They are the less encouraging factors, and pertain particularly to the dairy sector. For those of us whose inclination is to see the glass half full, there are also plenty of reasons to be cheerful in the wider rural property market. Sheep and beef farms, for example, are running hot right now, with returns at record levels, which is creating enthusiasm for any suitable property offered for sale, particularly those at the upper end of the scale. We have seen some exceptional sales of drystock grazing and finishing properties in Hawke’s Bay, Horowhenua, Marlborough and Southland, with outstanding listings set to follow the same trajectory in Wairarapa, North Canterbury and South Otago. Kiwifruit orchards continue to change hands at ever-increasing prices. Early in the spring $1 million per canopy hectare became established as the new benchmark for the most favoured Bay of Plenty properties growing the sought-after G3 variety, literally the ‘gold standard.’ This represented an increase from $850,000 per canopy hectare just before the end of the previous season, though in fact was even greater than that as orchards changing hands late in the 2016/17 season also had fruit on, with guaranteed income, while those selling in the spring did not. Viticulture development is also driving prices for both vineyards, and bare land suitable for grapes, to new heights. 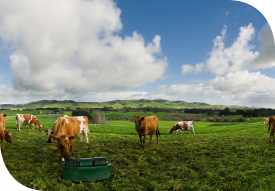 Within the media and in the rural property market, many people are discussing the new government’s policy on foreign ownership of New Zealand land. Although this policy’s detail is not yet fully understood, its influence on the overall rural property market is likely to be minimal. Per annum rural property transactions between vendors and overseas buyers are rare, accounting for only a miniscule proportion of the total market. Sensitive purchases are generally confined to large dairy farms and extensive high country property. Elsewhere, the recent directive to the Overseas Investment Office is likely to have minimal impact. Aside from high country and large dairy, the new policy will not alter either the volume or the values of transactions. While there may be some changes in those two specialist areas, elsewhere the market will continue as normal. What will also continue is that within those specialist markets, and through the broader rural property sector, PGG Wrightson Real Estate’s nationwide reach, through our network of 65 offices and specialist sales teams, will remain the best way to successfully match vendors with well-qualified buyers. What will the summer rural property market deliver, then? More of the same is likely. Those willing to sell sheep and beef property, vineyards or orchards, particularly those growing kiwifruit, should achieve satisfaction. On the other hand, plenty of dairy farms have been offered for sale in the past few months. In the current circumstances, some of these should sell through the summer, others may take longer. Although in the other sectors it remains a sellers’ market, in many respects more so than ever, with an increased number of dairy farms available than at any time in the past four years, the advantage in the dairy sector is swinging away from sellers and towards buyers. Sellers may take some time to adjust to that new reality, in which case, until a stronger consensus is forged on the value of dairy land, sales will be rare. As ever, the market is complex. Whether you are buying or selling, an experienced, objective rural property specialist will help achieve the outcome you seek. In all regions, throughout the country, and every sector, PGG Wrightson Real Estate is close at hand, and ready to assist. We look forward to your call. > To read more articles from the Rural Property Pulse, click here.